Aghamollaei, H., Choopani, A., Heiat, M., Gheybi, E. (2016). Evaluation of the Level of Awareness on Sterilization Methods in a Research Center. Journal of Applied Biotechnology Reports, 3(2), 433-436. Hossein Aghamollaei; Ali Choopani; Mohammad Heiat; Elaheh Gheybi. "Evaluation of the Level of Awareness on Sterilization Methods in a Research Center". 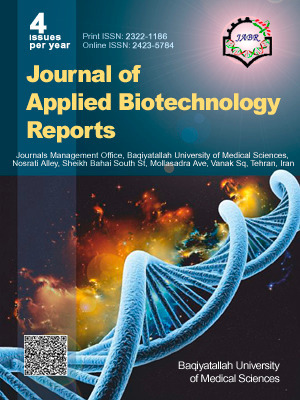 Journal of Applied Biotechnology Reports, 3, 2, 2016, 433-436. Aghamollaei, H., Choopani, A., Heiat, M., Gheybi, E. (2016). 'Evaluation of the Level of Awareness on Sterilization Methods in a Research Center', Journal of Applied Biotechnology Reports, 3(2), pp. 433-436. Aghamollaei, H., Choopani, A., Heiat, M., Gheybi, E. Evaluation of the Level of Awareness on Sterilization Methods in a Research Center. Journal of Applied Biotechnology Reports, 2016; 3(2): 433-436. Observing the correct principles of sterilization is one of the most important strategies to prevent infection transmission and, also, to reduce the time and the cost of research projects in biological sciences. The aim of this study is to evaluate the awareness of employees in a research laboratory in an institute of medical sciences. In this cross-sectional study, a questionnaire was designed, which contained important items of sterilization, such as autoclave performance and its quality control, conditions of sterilization by oven, and the principles of surface disinfection, and distributed among the staff. Forty-four filled questionnaires were collected and the results were analyzed using SPSS version 17. There was a significant correlation between the level of education and the level of researchers' knowledge about the principles of sterilization (P<0.05), in a way that the individuals with PhD degree had a higher percentage of correct answered questions. There was a significant relationship between the duration of activity in the laboratory and the level of knowledge on the principles of sterilization. Level of the staffs' knowledge about sterilization procedures is not desirable and there is a need for researchers training.